TV with Thinus: Former Top Gear presenter Jeremy Clarkson heading to South Africa in mid-July for first studio audience recording for new car show, The Grand Tour. Former Top Gear presenter Jeremy Clarkson heading to South Africa in mid-July for first studio audience recording for new car show, The Grand Tour. The former Top Gear trio of Jeremy Clarkson, Richard Hammond and James May are heading to South Africa in mid-July where they will film the first studio section of their new show, The Grand Tour, for Amazon. After a lackluster debut of the BBC's new Top Gear that recently visited South Africa to film a challenging race from Durban to the highest bar in Lesotho, Jeremy Clarkson announced that the team which jumped to Amazon after an ugly behind-the-scenes fight, will be heading to South Africa first to film for The Grand Tour. 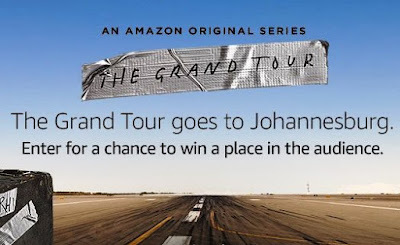 The Grand Tour will launch as a video-on-demand (VOD) streaming show on Amazon and might well be picked up by another South African broadcaster like M-Net that's already showing Amazon shows like Transparent and Mozart in the Jungle. The Grand Tour will record in Johannesburg on 17 July and is looking for studio audience members. This will be the first studio segment recorded for the show. "The pre-recorded studio section of the programme will be filmed in front of a live audience, all housed within a giant tent," The Grand Tour team said on Amazon's British website. "To celebrate, Amazon is giving fans the opportunity to win one of three pairs of tickets, travel and accommodation to be part of the recording in Johannesburg". People can enter from now until 8 June through Twitter by using the hashtag #TheGrandTour and must attach a photo or video of the strangest place they've ever put up a tent with the trio of presenters who will choose the final three winners out of a shortlisted top 10.